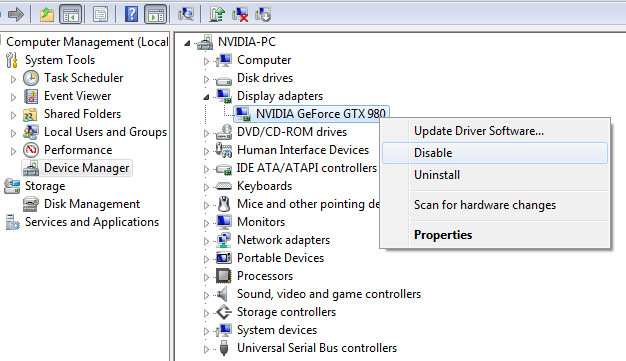 i have a realy new GTX 970 (Arrived 2014-12-06) and i´m unable to flash a new Bios. “NOTE: Firmware image requires a newer verison of NVFLASH. Current Version is 5.190 and i can´t find a newer one. you have to use nvflash at version 5.196 which is called nvflash by pass certification version. Hey, I followed these settings to a T. However, I believe because of that I am having slightttttly different results. In precision X, my slider for TDP is now max at 161%. 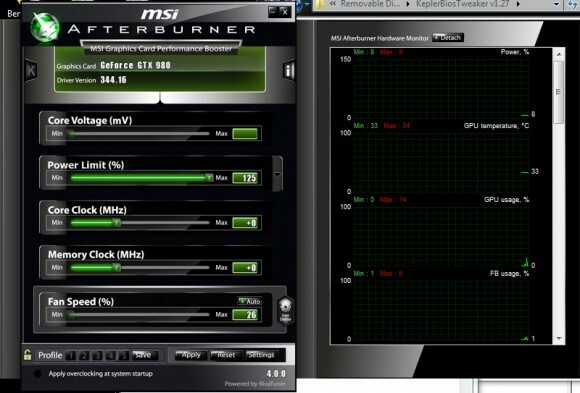 I noticed once I went over 110% running furmark that my card FINALLY stayed ABOVE base clock of 1190Mhz, my boost clock is 1342Mhz. However, I topped out at 1252Mhz, even sliding up the TDP Max to 161%. 2) I’ll finally be able to maintain my boost clocks? THANKS FOR THIS SWEET GUIDE BTW! 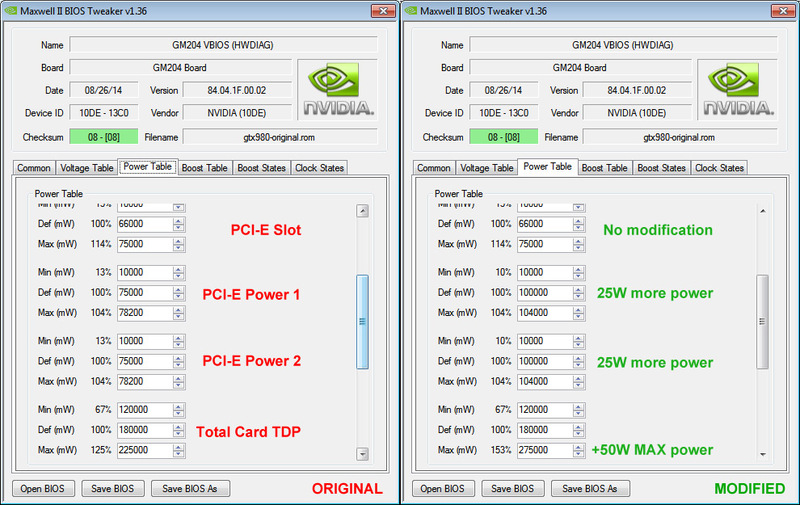 according to your tutorial my pciE power 1 and 2 have different values … my tdp slider goes up to 110% … so i know whrer the tdp limit is …but i neeeeeed help to point out the PCIE option. 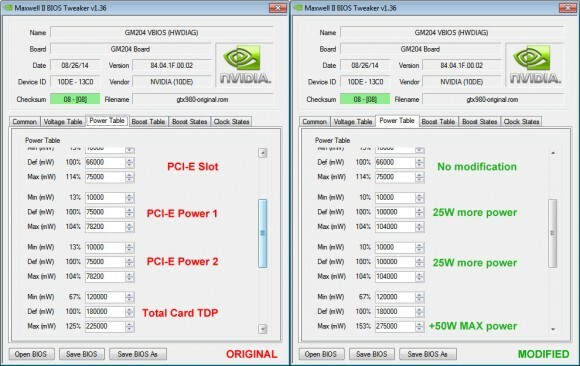 very sorry i mean gtx 970 …by the it hase a 8pin and a 6pin power connectors. 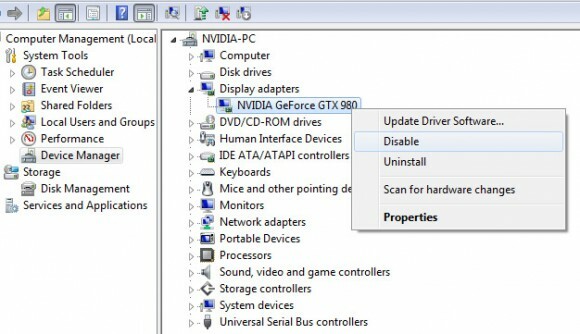 Modifying the video BIOS can brick your card if you are not careful and mess with things you don’t know, so always make a backup of the original BIOS first so in case of problems you should be able to restore the default state of the GPU.